On the 4th of May scientists from eXcorLab visited the Rudolf Virchow Center. At a meeting with Prof. Dr. Bernhard Nieswandt, Dr. David Stegner and Dr. Georgi Manukjan recent aspects in the use of dialysis methods were discussed. eXcorLab GmbH was originally founded in 1983 as the biochemistry und cell biology laboratory of Akzo Nobel and deals with membrane applications in medicine and biotechnology. Since 2005 eXcorLab GmbH is an independent company. Core competence of eXcorLab GmbH is performing in vitro and clinical studies and contract research in the field of membrane applications in medicine (dialysis, apheresis, oxygenation). 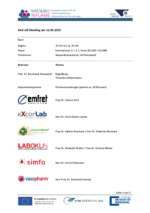 eXcorLab GmbH co-operates with more than 20 international partners in the medical device and pharmaceutical industry. eXcorLab GmbH accompanies the development of precursors for medical devices (e.g. dialysis and oxygenation membranes, plasma separators oxygenators), and biomaterials (e.g. bone cement) to the application in life sciences (medical device technology, biotechnology). On the 17th of January the first company visit was taking place. 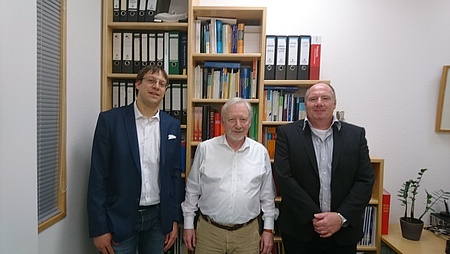 Prof. Dr. Bernhard Nieswandt und Dr. David Stegner have met with Dr. Ulrich Pachmann to discuss details of future collaborations. Kick-off meeting between scientists of the Rudolf Virchow Center and partners from regional companies emphasizes chances of the innovative ERDF-project for the study of thombo-inflammatory diseases. 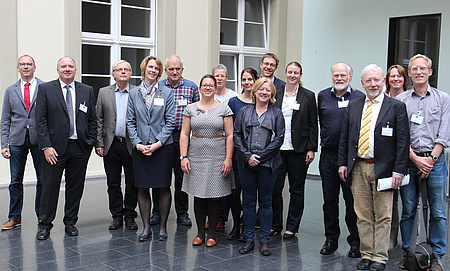 Scientists from the Department of Experimental Biomedicine and Vascular Medicine, headed by Prof. Bernhard Nieswandt, and representatives of the six cooperating companies met on Friday, 12 May, to discuss the possibilities and prospects of the newly founded translation network “Thrombo-Inflame”. Aim of the network is to provide a platform for scientific exchange bewteen university research and local biotech companies to pool the strengths in favor of developing new diagnostic and therapeutic methods for thromboinflammatory diseases. Besides the introduction of cooperation partners on the one hand and research projects on the other hand, the meeting provided an excellent opportunity to elaborate the shared objectives and to start initial cooperation projects. Finally, the basis for a successful communication of the progress and achievements of the translation network was set by the presentation of the newly launched project website. 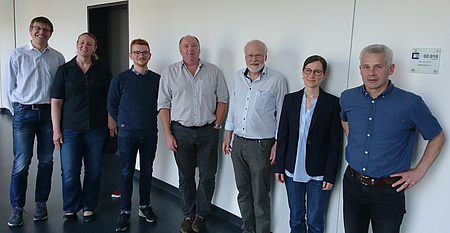 Involved in the project are the scientists Prof. Dr. Bernhard Nieswandt, Prof. Dr. Harald Schulze, Dr. David Stegner, Dr. Julia Preu, Dr. Markus Bender and Dr. Irina Pleines. The cooperation partners include the biotech companies EMFRET analytics, immunoGlobe, eXcorLab, SIMFO and VASOPHARM, as well as the diagnostic company LABOKLIN. The project is funded with approximately 1.8 million euros by the European Regional Development Fund (ERDF) and will help to improve the technology transfer between science and industry.